Why Didn’t the Heirs of a Credit Mobilier Swindler Burn His Incriminating Papers? Sheila Myers is an Associate Professor at Cayuga Community College in Upstate New York where she teaches environmental science and ecology. After staying at one of the Great Camps built by William W. Durant in the Adirondacks, Myers decided to write a historical novel about the Durant family. 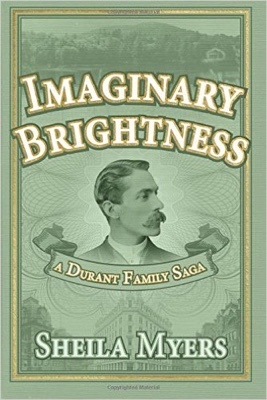 Her first novel in the trilogy: Imaginary Brightness: a Durant Family Saga was published in 2015. The website chronicling her research journey can be found here. What if you knew buried in your father’s papers was evidence he had committed a crime? This is what I’ve had to decipher while researching the family history of a notorious robber baron, Dr. Thomas C. Durant. The mystery lies with Durant, his son William West Durant, the Credit Mobilier scandal of 1868, and the tainted books of the Union Pacific Railway: hidden and not revealed until well after the deaths of both men. Credit Mobilier was a front company established by Dr. Durant in 1864 to handle contracts for the Union Pacific Railroad during the construction of the transcontinental line. At the time of its inception Durant was Vice President of the Union Pacific. As one of the founders of the Credit Mobilier, he also benefited financially from the contracts he negotiated with the U.S. Government. Even more scandalous was that he and his successor Oakes Ames, a prominent Republican congressman from Massachusetts, bribed politicians with Credit Mobilier stock to look the other way while the company charged exorbitant prices for the construction work. In some cases the dividends on the stocks paid seven to eight hundred percent on par value. According to an account of the affair by Edward Winslow in 1873, Ames divvied out stock to “friend” in congress. Durant did the same. However, when the issue came under public scrutiny it was Ames who took the fall. In 1867 a disgruntled investor showed the newspapers evidence in the form of a letter Ames had written to him naming several politicians as recipients of Ames’s policy of placing stocks where “they would do the most good.” There was some public grumbling which came to a head in 1872 when the New York Sun ran with a headline “The King of Frauds; How the Credit Mobilier Bought Its Way Through Congress.” The government had to act. Congress instructed the Poland and Wilson Committees to look into the wrongdoings of Credit Mobilier and their stockholders. Eventually Ames was censured. Many of the politicians named were disgraced – not because they were accused of bribery but because of the fact they denied they even owned stock in Credit Mobilier and in some cases, perjured themselves. Those documents Durant claimed to have no knowledge about surfaced years later, in 1937. They were discovered by one of the family lawyers, after Dr. Durant and his son William were dead. It was William's second wife Annie that saved the documents from a burn pile. According to Richard Kolbet in his papers on the Levi O. Leonard Railroad Collection housed at the University of Iowa, Annie Durant contacted Leonard because she knew he was tracking information about Durant and the Union Pacific. She notified him that she had in her possession more Durant documents, stating "these papers had turned up in a lawyer's fire-proof vault – where they evidently [had] been put years ago for safe keeping." Safe keeping? Or hiding? These were the ledgers from the Credit Mobilier Company dated 1863-68 – the same documents Durant claimed to have no knowledge about during the Poland Wilson Committee hearings. Leonard conjectured that Durant, facing lawsuits from creditors of the Union Pacific, and an investigation by the federal government, hid these documents in 1869. One of those lawsuits was filed by James Fiske who, in a state of outrage, broke into the Union Pacific Railway offices in New York City trying to uncover and expose the corruption of the Credit Mobilier. When the lawsuit was filed, Durant must have realized the heightened scrutiny put him at risk and hid the documents because Fiske found nothing to help his cause. Why didn’t Dr. Durant just destroy them? One might speculate he thought they might prove useful later as a form of blackmail. When, in 1937, Leonard received news of these long lost documents he immediately went to New York City to retrieve them from Annie Durant and bring them to the University of Iowa where he was cataloging his research. The question then remains: did Dr. Durant’s son know about these documents? I conjecture he didn’t. In 1926 William West Durant had donated to Leonard what he thought were all of his father's Union Pacific papers, stating: I know you will do "justice to my father's memory." Which brings up a final question: if William had known about the Credit Mobilier papers, would he have done what his father failed to do and destroy them once and for all? If William wanted Levi Leonard to do justice to his father’s memory, I must assume that like his father, he wanted the Durant link to the Credit Mobilier scandal to remain unknown to history. And if the historian Levi Leonard hadn’t been so tenacious, both Durant men would’ve gotten their way.